You who are listening on the radio are sharing with us the services of the First Baptist Church in Dallas. This is the pastor bringing the eleven o’clock morning message entitled The Witnesses to the Gospel, or, The Perplexity of the Prophets. 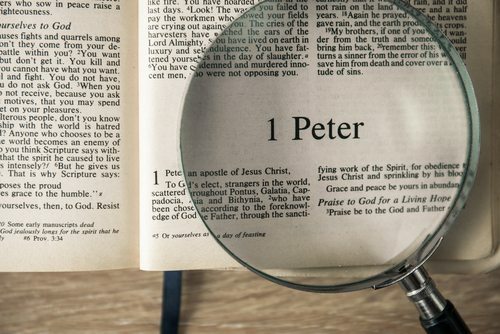 Last Sunday evening, in our preaching through the Bible, we left off at the ninth verse of the first chapter of 1 Peter. We begin today at the tenth verse of the first chapter of 1 Peter, and preach through the twelfth. Almost to the end of your Bible, the first letter of Simon Peter; and you can easily follow the message in the Bible if you would so desire. About that salvation the prophets have inquired and searched diligently, who prophesied of the grace that should come unto you. Those prophets searching what, or what manner of time the Spirit of Christ which was in them did signify, when it testified beforehand the sufferings of Christ, and the glory that should follow. There is no new salvation, nor is there any new gospel. The prophets spake of it in the millenniums and in the centuries before the days of Christ. And the apostles but repeat what the prophets did say and did see. The gospel is found in Isaiah as it is found in the epistles of the apostle Paul. The gospel is found in Daniel as it is found in John. There is no new Spirit; the same Spirit of God that spake through the apostles spake in the days and through the prophets. There is no new substance in the Book; it is the same story and the same message throughout its many years and its many pages. The gospel never changes. It was announced in the garden of Eden [Genesis 3:15]. It was developed in the revelation of God through the prophets. It came into glorious life and immortality in the resurrection of Christ from the dead [2 Timothy 1:10]. And it has been preached in the power and unction of the Holy Spirit of God through the centuries since. In the prophets, as in the apostles, the gospel is the announcement of the good news of the gift of God by grace [Ephesians 2:8]. It is given away. · Isaiah proclaimed it when he said, in Isaiah 55:1, "Ho, stop, look, all ye that thirst, come to the waters; yea, buy without money, and without price." · And the apostle Paul said the same thing in Ephesians 2:8-9, "For by grace are ye saved through faith: it is a gift of God: Not of works, lest any man should say, I bought it." The gospel is the same in the prophets as it is in the apostles. It was proclaimed in ancient days by faith; and it has never changed. · In Genesis 15:6, "And Abraham believed God; and his faith was counted for righteousness." · The same thing in Paul’s Romans 4:5, "Now to him that worketh not, but believeth on Him that justifieth the ungodly, his faith is counted for righteousness." · Or the same as Isaiah said in 45:22, "Look unto Me, and be ye saved, all the ends of the earth" [Isaiah 45:22]. · Same thing as Jesus said in John 3:14, "As Moses lifted up the serpent in the wilderness, even so must the Son of Man be lifted up: That whosoever looks unto Him might have eternal life,Look unto Me, and be ye saved, all the ends of the earth" [Isaiah 45:22]. There is no new message. There is no new gospel. It is the same glorious announcement; whether it is preached by the court minister Isaiah, whether it is proclaimed by the country revivalist Amos, whether it is delivered by the sainted apostle John, or by the brilliant theologian Saul of Tarsus, always the same. The eyes of the prophets looked forward, and the eyes of the apostles looked back, and they meet in the person of Jesus, God’s Son, and our Savior. The gospel is the announcement of the good news, that God has deigned, has condescended, to walk in human shoes, and on human feet, and to speak with human tongue, and to live our human life, and to die for our human sins, and to exalt and to raise our human nature into the divinity and the glory of Him, our elder Brother who sits on the right hand of the Majesty on high [Hebrews 1:3]. The good news, the gospel that "The Word has become flesh, and dwelt among men, and we have beheld His beauty, the beauty and the glory as of the only begotten Son of God" [John 1:14]. · The birth of Christ is a gospel of the incarnation of our only and Almighty God, walking among men [Matthew 1:23-25]. · The Sermon on the Mount [Matthew 5:1-7:29], the words of Christ, are a gospel of kingdom citizenship. · The miracles of Christ are a gospel of the power of God over those awesome enemies of disease and pain and death [Matthew 11:4-5]. · And the tears of Jesus is a gospel of the loving sympathy and compassion of our Lord in our sorrows and in our bereavements [Luke 19:41; John 11:35; Hebrews 5:7-8]. · And the great mighty death of Christ is a gospel of God of the forgiveness of our sins [Hebrews 2:9; 1 John 2:2], the washing of the stain of our soul in the blood of the Lamb of God [Revelation 1:5]. · And the resurrection of our Lord [Matthew 28:5-7], and the ascension of our Christ [Acts 1:9-10], is an incomparably glorious gospel of our ultimate triumph and final victory [1 Corinthians 15:53-57]. Of that salvation the prophets have inquired and searched diligently, who prophesied of the grace that should come unto you: Searching what, or what manner of time the Spirit of Christ which was in them did signify, when it testified beforehand the sufferings of Christ, and the glory that should follow. They saw it, they beheld it, they spake of it, a thousand and a hundred years before the sufferings of Christ – the message of the atonement of our sins, and the glory that should follow [1 Peter 1:10-11]: the ascension of our Lord into heaven [Acts 1:9-10]. And there He reigns today, all authority in this earth and in the celestial cities and hosts and heavens above us, all of it in His hand [Matthew 28:18]; there not by a popular or election, but by the prerogative and decree of divine government and divine authority. And that infinite power which is unwasted, immutable, augmented, is ours today. And the man anywhere, any time, in any age, in any place that preaches the gospel of the Son of God has as his great witness the Holy Ghost in his soul and in his heart, and the infinite power of God upon him; the power of Christ unto salvation, to all who will look, who will hear, and who will obey [John 3:34]. There’s no diminution, there is no slackening, there is no waning or ebbing of the great seal of God’s power upon the gospel of the Son of God. Through these years and these centuries it has been verified in innumerable experiences and in countless numbers of millions of lives; and it is verified in our witness, and in our testimony, and in our lives today. Friday a week ago, I wish you could have attended our annual missions banquet, gathering together the leaders of our six missions, and to listen to those men as they stood up to testify of the grace of God that had come upon them; a man stand up and say, "I was in the gutter, and I was a lost sinner, and I was vile and unclean and undone. And this beloved pastor came and found me, and preached the gospel to me, and now I have a new heart, and a new home, and a new life, and a new destiny. Bless His name, praise His name, for the salvation that has reached down even unto me." These miracles of grace are happening every day. There’ll all around you. Look, look. The man sitting next to you, the woman sitting next to you, the youth in front of you may have been yesterday saved out of a life of misery and darkness and sin, and the love and mercy of God in Christ Jesus reached down even to them, and they found the glory and the light and the heaven that is now and yet to be. The sufferings of our Lord and the glory that should follow: some day, "Every knee shall bow, and every tongue shall confess that He is Christ and Lord, to the glory of God the Father" [Philippians 2:10-11]; "The prophets testifying by the Spirit of Christ that was in them of the sufferings of Christ, and the glory that should follow" [1 Peter 1:11]. May I avow here in this text a word of the verbal inspiration of the Word of God? If I had in my hand the manuscript of the holy apostle, or of the holy prophet, I would have in my hand the word by word by word that was inspired by the unerring Spirit of the living God. As Peter says a little later, "Holy men of God spake as they were moved by the Holy Spirit" [2 Peter 1:21]. And Peter says here the prophets did not understand what they spake. But when they delivered God’s message, and when they wrote down God’s Book, they searched themselves by the Spirit of Christ which was in them [1 Peter 1:10-12], seeking to find out the meaning of these hieroglyphics of time and of place that should be fulfilled in their age and in their hour. For unto us a Child is born . . . and His name shall be called Wonderful, Counselor, the Mighty God, the Everlasting Father, the Prince of Peace. And of the end of His government, there shall never be its final termination; and the zeal of the Lord of hosts shall perform it. He shall smite the earth with the rod of His mouth, and shall slay the wicked with the breath of His lips. And on and on he paints the glorious, incomparable kingdom and majesty of the Son of Jesse. Then, then, in the next stanza, in the next breath, and in the next verse, the great prophet will say, "He is despised and rejected of men; a Man of sorrows, and acquainted with grief" [Isaiah 53:3]. He couldn’t understand. He delivered the message as the Spirit of Jesus in him placed the words in his mouth, and penned the words as he wrote; but he couldn’t understand, and he couldn’t fathom, and he couldn’t comprehend. It baffled reason. "Of that salvation the prophets inquired and searched diligently of that grace that was to come" [1 Peter 1:10]. In its day and in its time, we have understood a part and a little, how He could be despised and rejected; a Man of sorrows, and acquainted with grief [Isaiah 53:3], and we have understood somewhat of the glory that does follow [1 Peter 1:11]. But, ah! We don’t understand all, not yet. Nor do we see all, not yet. Nor is it all clear and plain, not yet. In your life are mysteries of sorrow that cannot be explicable. And in your life are experiences and overwhelming providences that seem to have no meaning if God is good and God is kind. Wait, wait, wait [Psalm 27:14]. The prophets read, the prophets heard, they didn’t understand; but in their time, and in their day, God reveals the infinite wisdom by which He guides the destiny of a nation, and by which He overrules in your life. Wait, wait. And Peter says, "Unto whom it was revealed, that not unto themselves, but unto us they did minister the things which are now repeated unto you by them who preach the gospel" [1 Peter 1:12]. The prophet faithfully wrote it down, and he couldn’t understand it. He ministered, Peter says, not to himself, but in the providence and wisdom of God, he ministers unto us for whom these things were written, and upon whom the end of the ages has come [1 Peter 1:11-12]. One of the things, of course, is that by corroborating the testimony of the New Testament with what the prophets said hundreds and hundreds of years before, we have our finest proof and our deepest foundation for the immutability and the inerrancy of the spoken and written Word of God. This is God’s Book. This is God’s message. This is God’s heraldry. This is God’s announcement. No man can prophesy what will come to pass, even six months from now, much less a year or a generation. Those prophets lifted up their voices and prophesied in minute detail what should come to pass a thousand and a thousand years yet to come. And when that gospel is preached unto you that was delineated by the prophets thousands of years before, you have your finest proof that this is the immutable and unchangeable and verily the Word of God Himself. "Unto us they did minister these things which are now preached unto you" [1 Peter 1:12]. This gospel is preached unto us, he says, by the apostles and the evangelists whom we have heard, and whose writings are here writ large on the sacred page. They went forth, these apostles, no clothing except that of poverty and penury, no distinction did they have save that of shame and suffering, no power did they have save that of the unction of the Holy Spirit of God; yet in the midst of a warrior nation, they lifted up fearlessly their voices. In the quiet of peaceful homes they testified of the saving grace of the Son of God. They preached in the capital city of the Roman Empire. They took their message even into Caesar’s household [Philippians 4:22]. They carried it to the far away Scythians and Parthians and Barbarians, testifying of the grace of God in Christ Jesus our Lord [Acts 20:24]. And they did it in the power and the unction of the Holy Ghost, sent down from heaven [Acts 1:8]. The great attestator of the words of the prophets was the Spirit of God that came upon them [2 Peter 1:20-21]. The great attestor of the words of Jesus Christ was the Holy Spirit of God that came upon Him, that raised Him up from the dead [Romans 1:4]. The great attestor of the power and unction of the words and message of the apostles and the evangelists was the Spirit of God that like flame and like fire fell upon each one of them. And the power of the delivery of the message of Christ today lies in that same unction, and that same baptism, and that same heavenly enduement and endowment: the Holy Spirit of God [Luke 24:; Acts 1:8]. No man is ever saved apart from the testimony of the Son of God [Acts 4:12]. No man is ever saved apart from the gospel message of Christ our Lord. But for a man to deliver the message alone is not enough. There must be with it a divine unction, a divine moving, a divine baptism. There must be the witness of the Holy Ghost from heaven [Acts 1:8]. Before our Lord began His ministry, He first was baptized with the Spirit of God [Matthew 3:13-17]. And our Lord said to His apostles, "Tarry in Jerusalem until ye be baptized from above" [Luke 24:]. And God says that same thing to us today: for a man to deliver the gospel message of Christ in cold, removed theological intellectualism is to see the message of Jesus die stillborn, never live, never move, never weep, never cry, never turn, never be saved. I tell you truly, and this is corroborated by the centuries of history since, a man who preaches the gospel sometimes coarsely and crudely and rudely, sometimes mixed with error, but when he does it in the power and movement of the Holy Ghost, God saves men unto eternal life. But wherever the gospel is preached in cold indifferent intellectualism, there does it die. The preacher snoring theology, and a sleepy audience nodding from the pew in chorus, is a travesty in the presence of God, it’s an affront to the power of the moving Spirit of the Holy Ghost. When we come together in these hours and in these services, it ought to be in prayer, in expectancy, in holy awe and in wonder, in looking up to God, in beseeching and praying, in intercession and in asking. There ought to be in our midst the great moving presence of the third Person of the Holy Trinity. And every man and stranger and visitor and sojourner in our midst ought to feel in his soul the moving of the Spirit of God when we gather here in the name of Christ. Without a Christ we have no gospel to preach. And without the Holy Spirit upon us, we have no power by which to say it. The prophets, the apostles, the Holy Ghost sent down from heaven, and the angels: "Which things the angels desire to look into" [1 Peter 1:12], the marvel and the wonder of the gospel of the grace of the Son of God, "which things the angels desire to look into; when the prophets spake their words, they looked forward – with hushed amazement, every nerve taut and every muscle bent – waiting for, looking unto the first footsteps, footfalls of the coming King of glory. And when He came, the apostles looked in adoring adoration: "What manner of Man is this? He can speak, and the winds and the waves obey Him [Mark 4:35-41]. He can speak and the dead live in His sight [John 11:43-44]. He can speak and the foundations of darkness tremble and fall." In amazement they looked upon Him. And when He was raised from the dead by the power of the [Spirit] of God, they beheld in astonishment and in wonder [Matthew 28:17]. "Which things the angels desire to look upon" [1 Peter 1:12] – this wonder of the gospel of the grace of the Son of God. Tell me, if we had a window into heaven, think of the curiousness that would almost overwhelm us as all of us sought to look through and behold those celestial glories; if we had a window by which we could peer into the City of God. It is reversed here. There is a window somewhere, through which the angels look upon this fallen world, and they look in astonishment and in wonder. I would suppose the imagery of what Peter writes here is found in the cherubim: who looked full upon the mercy seat, whose eyes steadily gaze upon the blood of propitiation and expiation [Exodus 37:9]. And the angels look upon us in this fallen world. Here are men who blaspheme the name of God. Here are men who live in iniquity and in villainy. Here are men whose lives are stained with sin and wrong. How could God save to the glory of the celestial city, men steeped in sin and lost in death? And the angels look, and they gaze steadfastly upon the blood of the cross of the Son of God, and wonder and marvel at the grace of the Almighty that reaches down, even unto us [Philippians 2:7-8]. "Which things the angels desire to look into," marveling and wondering what God has done to take a man that is a sinner, to take human beings such as we are who are born unto death, and make of them celestial saints above the highest orders of the hosts of glory, oh, the wonder of it, the unspeakable marvel of it. And the angels look upon it, desiring to understand it [1 Peter 1:12]. That’s why I had you read the passage this morning, that, "Unto the principalities and powers in heaven, might be made known through us in the church, the wisdom of God according to the eternal purpose which He purposeth in Christ Jesus our Lord" [Ephesians 3:10-11]. To the angels it was a thing beyond what an angel even could enter into, when their crown Prince volunteered to be an atonement, an expiation, a sacrifice for our sins [Hebrews 10:4-15]; and how God can justify the ungodly and still be just [Romans 3:23-26]; how God can take a sinful man and lift him up above the seraphim and the cherubim, above the archangels of glory; now judges with Christ, sitting upon the throne, judging angels and men [1 Corinthians 6:3], Jesus says. To the angels it was beyond reason and comprehension, and they looked upon it in amazement and in wonder. And according to the Word of our Lord, they looked down upon us in expectancy, in breathless hopefulness; "For," said our Lord, "verily, truly, I say unto you, there is joy in heaven over one lost, hell-bound, dead, destroyed man that turns"; more than over all others in the celestial city and glory of God. "Verily, verily," He repeated again, "I say unto you, there is joy in the presence of the angels of God over one sinner that turns" [Luke 15:10]. And when the service is over, and the benediction is pronounced, the angels say to one another, not, "Did he preach an eloquent sermon? Was his grammar beautifully balanced and his sentences in order and the paragraphs all in succession? Was his sermon magnificently thought out and delivered?" I don’t think the angels care about his grammar, nor do they care about his homiletics, nor do they care about his paragraphs and his perorations. But they say to one another when the benediction is pronounced, "Did somebody find Jesus as Lord? Was somebody saved? Did somebody knock at the door of glory? Did somebody hear the golden bells of heaven ring? Was somebody saved? Was somebody saved?" And that, my dear people, is the great intent and purpose of our calling and our commission and our gathering together: that we might be a congregation of the Lord before whom these who find Jesus might witness. "Whosoever shall confess with his mouth that Jesus is Lord, shall be saved" [Romans 10:9]. And we gather our congregation together, that these whom we have won to Jesus, whom we have introduced to our Lord, might confess that He is our hope and our Savior [Titus 2:13-14], now, in death, this world, the next world, in time, in eternity, to live and to die in Him. Oh, blessed gospel! Ah, blessed congregation! Oh, precious hour, that sees God’s people in prayer, in communion, looking forward to, in expectancy, that somebody this day might come to know our Lord. If God is pleased with us, if His Spirit sanctions the gospel we preach, may it be somebody you this morning, give his heart and his life to Jesus. Somebody you, join with us in the fellowship and the communion of this precious congregation. Would you come today? "Pastor, I make it now. I choose now. I decide now." In this balcony round, coming down this front stairway or the back, would you come? Would you come? On this lower floor, into the aisle and down to the front, would you come? "Preacher, I give you my hand; I give my heart to God." "Preacher, the whole family of us, we’re all coming together." As the Spirit shall lead the way, shall open the door, shall say the word that I cannot say, would you choose, would you make it now? On the first note of the first stanza, come. In the name of Jesus welcome, while we stand, and while we sing. B. If we had an open door to see into heaven, wouldn’t we all gather around to look in?